Football/Soccer Session (Moderate): Receiving the ball on the back foot. Receiving the ball on the back foot. 40 x 30 pitch. 12 Players 10 Minutes. Split players into two groups of six and position as shown. Number two outside players on one side and begin with a diagonal pass into the centre player. The receiving player has to receive the ball on his back foot. ie If the pass comes from the players left he is to receive it onto his right and vice versa. A key point is the player’s movement and body stance, he is to open his body out controlling the pass on his back foot allowing him the opportunity to progress the play either with a pass or run with the ball. Emphasize controlling the ball using his back foot which naturally places the ball within his natural stance. 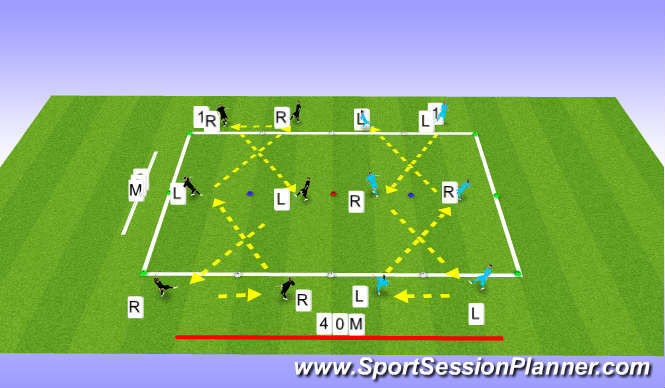 Rotate the players around and the direction of the ball to allow the players to experience all aspects. Add additional balls for older and more technical players. 40 x 30 pitch. 12 Players 20 Minutes. Split players into three groups of three numbering 1 to 4 and position as shown. Start with team one at one end and begin with a diagonal pass into the centre player who receives it on his back foot and passes to the opposite outside player who also receives it on his back foot. Repeat across the pitch always using the back foot to receive the ball. The Whole group progress to the other end of the pitch where team two take their turn towards team three. 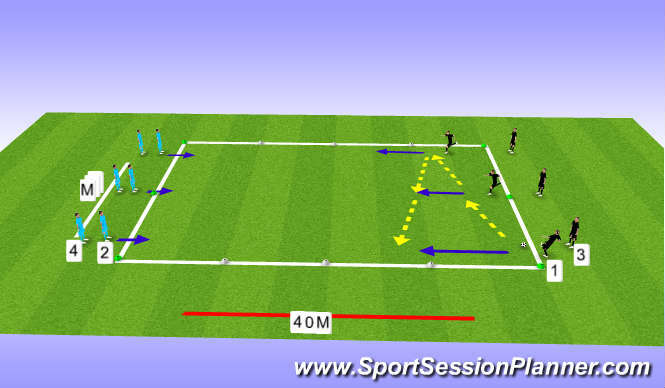 Rotate the players around between outside and inside of the ball to allow the players to experience all aspects. Increase the distance/width and the pace of play for older and more technical players.